We were very pleased to welcome two guests from Chile who had come to learn about our Live, Love, Learn approach in higher education.Teresa Freyhoffer works with the teaching and curriculum innovation leadership team at Universidad Alberto Hurtado (UAH) in Santiago, Chile. The university is currently undergoing widespread educational and curriculum reform to embed good practice for widening participation and inclusive learning and teaching, and to align the various degree programmes with regards to core structure, assessment and degree credits. Teresa has been instrumental in the curriculum reform and design for this project. Importantly, evaluation measures are being introduced to help students and teaching staff to understand the progress of students (who come from very diverse backgrounds) and to increase student retention and success in the programmes. Teresa was especially keen to understand how we apply the Live, Love, Learn approach to individualise learning with large groups of students, and how we tackle issues like inclusivity in active learning. Juan Carlos González is an assistant professor in Technological Entrepreneurship at Pontificia Universidad Católica de Chile (PUC) and an Entrepreneurship Broker at Incuba UC (the incubator of PUC), also in Santiago, Chile. Juan Carlos was especially interested in our use of process- and praxis- based curricula for project work and wanted to understand how we work with our undergraduates compared to his work with postgraduates. Juan Carlos has been building innovation and entrepreneurship relationships globally, but has also focussed on developing links with Colombia and Mexico in particular. It was a pleasure to host our colleagues and hear about their exciting work, as well as to introduce them to our team and Centre, and, most importantly, to our students. 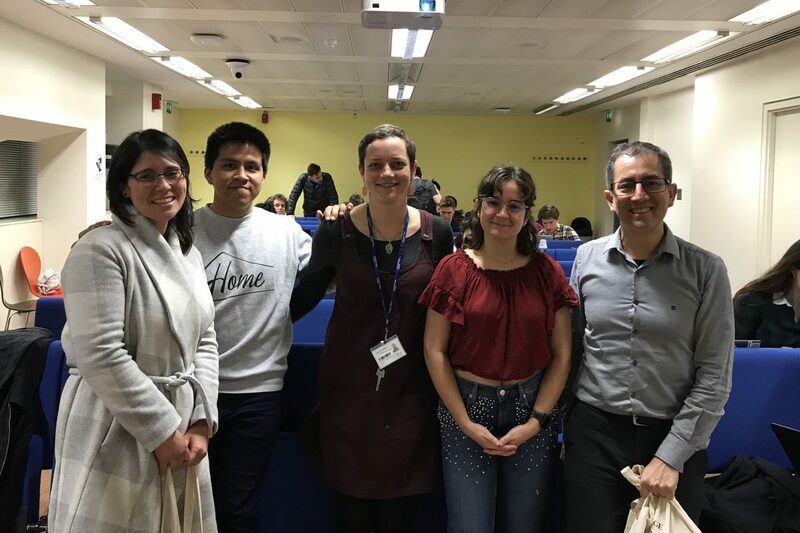 We were lucky that Teresa and Juan Carlos were able to attend one of our Lessons From History Classes to see our teaching in action, and to talk to the students about their own experiences of their learning – both in our courses and in their wider degree study. A few months ago I discovered Global Challenges program and I fell in love with it. It was a great motivation to travel to London and get to know the higher education system of the United Kingdom. The experience I had, was much greater than I expected. Talking with Elizabeth and Mark about the methodology they use was very enlightening. I had the privilege of attending the “Lessons in History” class and talking with the students, who are the protagonists of their own learning. In general, one of the biggest shortcomings of traditional college education is that students are not present as people who bring their own worlds, experiences, personality styles and views to the classroom. The Global Challenges approach does consider the set of contributions they represent and thus becomes a collective learning space in which the complexities and potentialities of teamwork are learned. The teaching and learning methodology transcends the traditional physical space of the classroom. Each student is committed to their learning and to the tasks that will allow the team to which they belong to take the challenge forward. It is a living space in which differences are discovered and valued. It is full of life, movement, conversation and a lot of work. Live, Love and Learn really represents the methodology of the program. I hope that in Chile the students of HE can have faster access to this type of teaching, learning and assesment experience.